A while ago we featured a Bee Inspired moodboard that we had put together for a special set of clients. We recently delivered Helen and Justin's invites and are thrilled to share them with you. Helen and Justin moved away from the traditional 'honey yellow' palette of a Bee inspired wedding and instead moved to an elegant cream coupled with a soft powder blush pink. 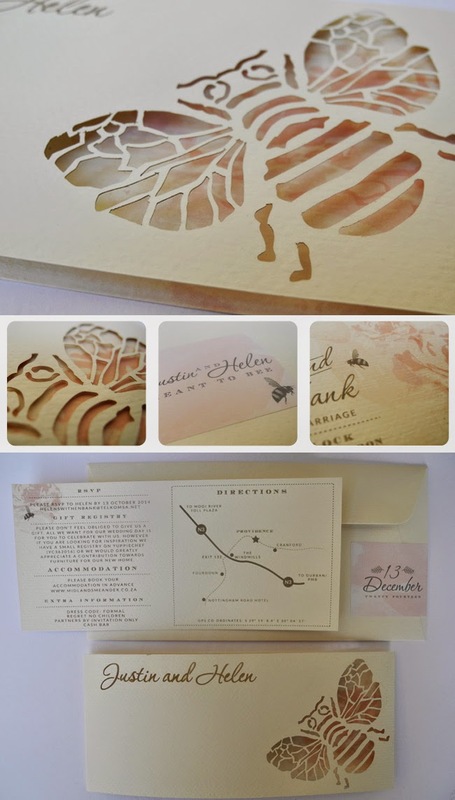 Their invite featured a laser cut bee on the cover, with hints of watercolour shining through. We had such fun putting these invites together and were thrilled with the results.